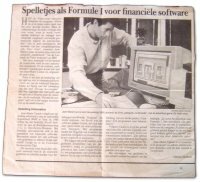 After doing more boring jobs (in stock market software & network solutions) Jean-Marie Cannie and Frank Van Biesen (company founders) wanted to have some more fun. The first thing they did was develop a Tetris game clone and offered it on floppy disks in the 'little ads' in Computer Magazine. Surprisingly, this caught on and people asked for more. JMC writes: "This was the time CD-ROM games like 'The 7th Guest' started to appear and we decided to do a CD-ROM and teamed with 'Private', one of the bigger players in the over-18 games market. We released a whole bunch of our CD ROMs including 'Private Prison' and 'Private Castle''. Around the same time, IBM held a "Da Vinci" contest where 1st prize included color laptops (which cost about $8000 back then). As we didn't have a lot of cash to spare we reworked an existing game, mailed it in and won 1st prize in the multimedia category. The most important part wasn't the win, but the fact we met a 19 year old developer called Didier Dambrin (known as Gol by our customers). Didier not only won 1st prize in the 'Game' category but the overall 'Grand prize' too. A trip to the US. We immediately saw his talent and convinced him to come and work for us. Gol's first game for us was Private Investigator. It was a little gruesome then, pretty mild by today's standards, but it that caused the rapper Ice-T to shout: "This game beats cocaine!"... after playing if for like half an hour on our booth at a show in Las Vegas. We decided to use Gol's talent for something better and asked him to develop a platform game, Eat This. Sadly, this was the same time that games were all going 3D and so it went unnoticed. You can still download and check out the demo on our Eat This page. The game really shows off Gol's coding and visual skills (remembering this was made in 1998). The rest of our developers continued on our other products like Fact2000 (invoicing software), E-OfficeDirect (a content-based web tool that was the precursor of EZGenerator). We even topped the Belgian game charts 4 years in a row with the CD version of a popular Belgian TV show called Blokken (a game based on Tetris). Meanwhile, Gol was being drawn into the music scene by applications such as Hammerhead and Rebirth 338. He had the idea of merging both into a step sequencer, so he started developing FruityLoops. When he dropped it on our machines it was a simple, MIDI-only step sequencer that we were having trouble placing in our existing product range, leaving us scratching our heads how to market it. This turned out not to be a problem as people went WILD about it and sucked our servers dry (downloading the demo) a few days after launch. It was also around this time we came up with the idea of Lifetime Free Updates for the program, that existing customers should get the latest version of the software for free. The first couple of years were pretty tough as there were hardly any sales and we had to beg people to host the Fruityloops demo on their servers (thanks Maz!). To generate some additional income, Gol developed an EJay type program called FruityTracks that was "OEMed" for Mattel into Pro-DJ (for France & UK) and Radio 538 Music Machine (for Holland & Belgium). During this time FruityLoops slowly grew from a simple midi drum machine into the fully featured virtual studio that a wide range of musicians are using today. 'Fruity' seems to have all sorts of meanings associated with it that we thought best to avoid for the sake of marketing appeal. The 'Loops' part of the name implied that music was made from pre-canned loops and no 'musician' wants to be associated with that. We even had one customer almost lose a contract, because their label heard about them using FruityLoops and thought they were using a 'pre-canned loops'. Program development was in the opposite direction to loop-based Acid/Ejay, so people buying 'FruityLoops' thinking it was a similar app didn't have a clue what to do when they were confronted with a Step Sequencer and Piano Roll. 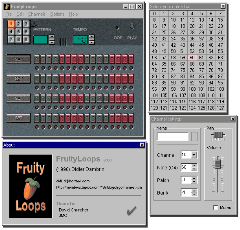 No one ever took the 'FruityLoops' name seriously. Whenever we went to a meeting to discuss bundling with hardware manufacturers, we ended up explaining for half an hour that FruityLoops WAS a real music production package, while their marketing managers opposite, were looking at us with grins on their faces. Since we changed the name we started to be taken more seriously and customers are happy to tell people what application they are using to make music. The FL Studio trial is now downloaded over 30,000 times PER DAY and is used by some of the biggest names in the industry. We have definitely come a long way thanks to our customers support.